Andhra Pradesh: Doctors are crying foul with the state government’s new initiative to impart para medical training to registered medical practitioners (RMPs) in order to utilise their services at rural medical posts. The Government of Andhra Pradesh have decided to give Community Para Medic Training Programme to the Registered Medical Practitioners (RMPs) / Private Medical Practitioners (P.MP). After training/certification to the Rural Medical Practitioners/Private Medical Practitioners shall be called as Community Para Medics. The move has not gone well with the allopathic doctors in the state, who have accused the government of promoting quackery in the state. The Indian Medical Associations has condemned the State government’s decision to provide legal rights to RMP and PMPs. 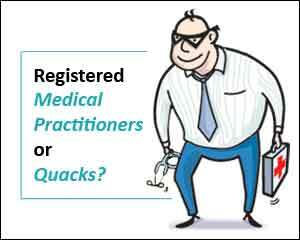 Registered Medical Practitioners or RMPs, basically with no recognized degree in modern medicine, are no longer recognized in the allopathic system and not allowed to practice. AP government used to give recognition to such medical practitioners by conducting tests, hence, they were called registered medical practitioners but the system was stopped from 1970s. Idiotic move of highest order. That shows the level of ignorance of our politicians and beauracrtics .